Security officers include (first row, left to right) Tina Salazar, Phillip Montoya, and Orlando Martinez Jr.; (second row_ Sgt. Jason Tapia, Joseph Lujan, and Paul Pacheco; (back row) Marvin Romero, Joshua Montoya, Orlando Martinez St., and David Gallegos. 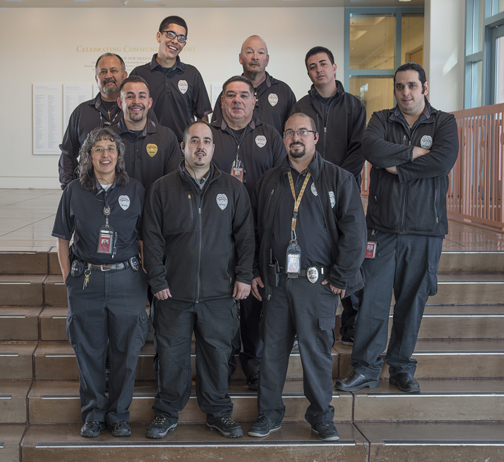 From 6 am until 5:30 pm—and often later—the New Mexico History Museum and Palace of the Governors fall into the capable hands of our security staff. Currently 14 people strong, the crew does everything from ensuring precious artifacts are safe to dealing with customer complaints, helping fix broken toilets, finding lost children, explaining portions of exhibits to visitors—and then some.